The Romans built a fort on the banks of the River Taff in the first century AD. It seems that once they left the area quickly became uninhabited and remained so for several centuries. In 1095 Robert Fitzhamon built a castle beside the river and a small settlement was established. For the next 700 years Cardiff remained just a small fishing community. 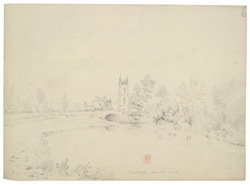 The population at the start of the 19th century - and around the time of this drawing - was only 1000. The Bute family, who owned much of the surrounding land, decided to take advantage of the new opportunities offered by industrialisation, especially the coal industry. They set about transforming their village into a major port, which would soon become one of the busiest in the world - a far cry from the tranquil scene depicted here!